This week we learned that tall buildings in Los Angeles no longer need to have “flat tops,” the rooftop helipads, mandated for fire safety reasons since 1974, that resulted in few helicopter rescues and a downtown of mostly uninspired, stumpy towers. Ending that rule means the shackles are off for developers and designers wanting L.A. to join other world cities in the race to build the shapeliest skyscrapers. Turns out these towers are “wiggly and squiggly” thanks to advances in computer design technology that also enables towers to be veritable exercises in data-driven “performance” — from the energy-efficiency of the window wall to carefully calibrated environmental systems, social spaces and infrastructure. This is all explained in a new book by architect Scott Johnson (founding principal of Los Angeles firm Johnson Fain), entitled Performative Skyscraper: Tall Building Now. Johnson, who cut his teeth working on towers in the office of the late Philip Johnson (no relation), patriarch of American Modernist and then Postmodern architecture, is a designer of towers himself, but his book surveys — with apparent lack of competitive ego — designs by many of his fellow professionals, including Norman Foster, OMA, Ken Yeang, SOM, Adrian Smith, Sauerbruch Hutton, Morphosis and many more. In an interview with DnA, Scott, above left, talked about what “performative” means, “gentler, kinder” skyscrapers, as well as one of his current projects, the retrofit of a Southland building by his onetime mentor Philip Johnson: the Crystal Cathedral. Listen to the interview and read the full Q&A with Scott Johnson below. 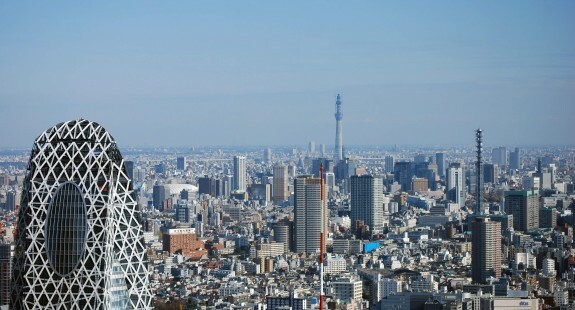 DnA: When people go to cities like London or Paris or Sao Paolo they are seeing an explosion of tall towers and many of them are quite extraordinary looking. What is going on? Scott Johnson: If I could say in a word, the answer is software, and the excitement and possibilities that come from the computer, and how it’s so invasive in the process of design. It allows us to measure and track highly conceptual ideas. If the entire team, that not only designs but engineers and builds the project, is in tune and capable of using the same kind of tools then the project can be very different than it was even a decade ago. DnA: And the outcome is both in shape and in so-called performance? SJ: Exactly. And again this comes from our interest in our involvement with digital programming, and you see it in the most obvious way in shapes; buildings now can be hybrid and morphed in shape. That’s the obvious thing, but there’s also a set of other things- in fact, we talk about parametric modeling, that is sometimes the term, used for this computer-based process, and structural engineers have done it for a long time. They have always tried to optimize the stresses in a building’s structure, and in a tall building that’s a very important thing, and potentially a very costly thing, but for the last decade some architects have taken over and begun to use similar systems to visualize and conceive very complex forms. SJ: Well, performative just means performance-based, but in the context of where we are here today, with the ubiquity of computers as part of the process, it means that the buildings now can and need to perform in a lot of ways. Some of those have to do with the obvious aspect and form. Some of them might have to do with energy management or sustainability. Some of them might have to do with sun and visuality and the ability to see through skins, or do quite the opposite and protect skins from either glare, too much light, or heat that the sunlight brings. These tools are now accessible to not just the designers, but all the engineers and consultant team, the clients, so there’s an iteration between groups as to developing the final building. DnA: There’s a number of towers that have become quite iconic. 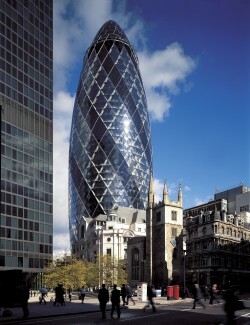 For example, the so-called Gherkin, in London (above right), or in Chicago, the beautiful Aqua Tower (left). These are buildings that are more curvy than towers used to be, and people might think that they cost more or that they are simply show-offy buildings. But are those buildings shaped the way they are for “performative” reasons? SJ: The two buildings that you mentioned might be show-offy, but something might be show-offy but not cost a lot. In the case of the Gherkin, Foster and Partners were really, at least according to them, more interested in aerodynamics, and wind, and ecological energy management issues, something that firm has been interested in for a long time. They capture the aerodynamics of a curved shape that accelerates wind in a way that a rectangular shape doesn’t, and they capture that wind and ventilate the building in an interesting way, and they would tell you that’s why it looks like a gherkin. In terms of Jeanne Gang, and the wavy building she designed, the Aqua tower, in Chicago, that is really a rectangular plain building, like has been built forever, and it’s “decorated” if you will, by balconies which are sinuous and run around in uneven ways around the building, creating these very tortile* shapes out of an otherwise very rectangular building. I consider that more decorative because those balconies aren’t really fundamental to the working of the building, but they continually change the image of that particular skyscraper. DnA: Your book was inspired by an experience you had with a tower you were working on and glass. Can you talk about that? 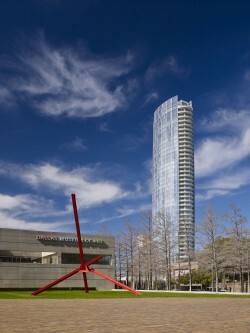 SJ: Well, a lot of the information in the book was developed in working on Museum Tower in Dallas (below right), and we did a building in the arts district, and as we were just about complete it, there were difficulties between our building and the Nasher Museum adjacent to us, because they had developed a set of skylights that were directed and unprotected in the direction of our site. When we came in, our building has a degree of reflective coating on it, and the sun reflects some of the glass, and that comes in through some of the clerestories. There are a lot of misunderstandings about this whole piece, and we have recommended adjustments to some of the apertures in the shading system in the Nasher and thus far there’s been no agreeable solution between owners of the two buildings. But I think this is a topic that is important, the neighborliness of buildings, particularly in terms of building materials and reflectivity, adjacencies and all that. I’m hopeful it will be solved and its something that needs to be done in cities going forward. DnA: Reflectivity is a big issue increasingly with towers, in fact there was a famous instance in London of a tower that was melting cars on the street! SJ: There have been several examples, that one freakily is called the Walkie-Talkie building, and is by Rafael Viñoly. It had a reflective glass, but it also had a concave surface, so it was not only reflecting the sun, but it was also intensifying the rays about a certain point, and if you happened to be in that point of concentrated rays, then things seemed to be melting. This is my understanding. DnA: Let’s talk for a moment about “skins,” an important piece of tall buildings today. In what way? SJ: Well, skins are very complex today, and they do deal with the issue of performance. Your very own skin, if you think about it, it’s an outside surface, it needs to be durable to the outside world, and it also ventilates, it perspires, it does many things. It keeps you warm, it thermally insulates you, well. All of those things and many more happen in a building’s skin as well; the elements, managing sun, energy, heat, insulating the ambient temperature inside the building, it is a very complex thing made out of manmade substances. 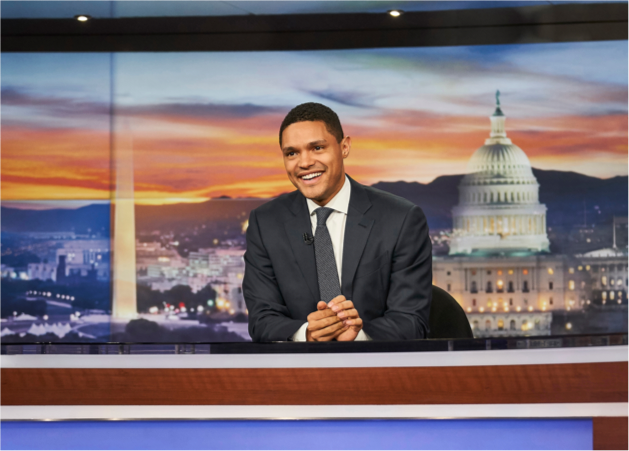 So, we talk about that, particularly in relation to its performances and how those performances yield certain formal effects, or visual effects on the building’s skin. DnA: In the introduction to the book that’s written by Joseph Giovannini he writes that towers are built out of repetitive standardized parts, and that now one can build gentler, kinder, more inspired skyscrapers, using these digital tools you’re talking about. Is that so? SJ: I think the possibility is certainly there, and there are some examples it is happening, or beginning to happen. I think that this is a process that will take time, and it will succeed broadly when the entire chain of command in the design and the engineering and the construction of a building is seamless and operating completely in a digital environment. What was seen so custom at one time won’t be so custom in the future and as people get more familiar with operating within the digital realm, they will be able to create buildings that are highly optimized in terms of performance but also extraordinary, different, highly custom, and I think in that sense humane. DnA: But can a very tall building every really be humane? By definition, they’re not human scale. So how do you make a building that’s not human scale, somehow gentle? SJ: I think that the issues about a tall building being human or humane has a lot to do with what’s happening at the ground plane, how gently a building sits on the ground plane and its relationships to other buildings that are also rising out of the ground plane. 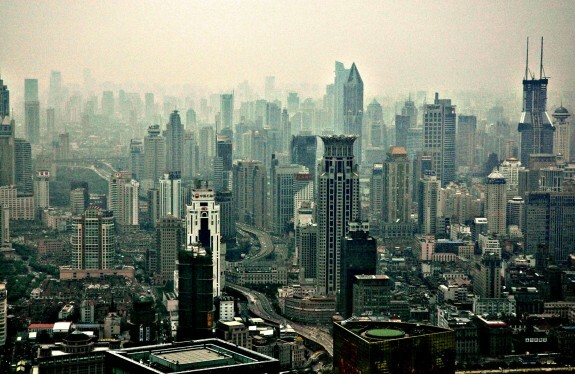 I think the great move to the cities which is underway — more than half of the world lives in cities — means the future is dense so the future will inevitably be more vertical. And while a building may be big, everything that happens within a floor is to human scale; also the way a building is perceived is up close, in the mid-distance, and its perceived crosstown in the far distance. So these are the ways in which I think a humane tall building has to be conceptualized. DnA: You’ve really studied the work of a lot of your fellow architects, in capitals and cities around the world. Are there any towers that you particularly like, or find especially instructive? 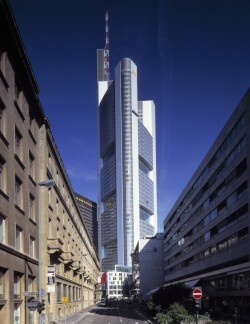 SJ: Commerz Bank by Foster and Partners in Frankfurt (left), strikes me as a particularly auspicious building. It takes the office space content of the occupied area of the tower, and it puts in triangular spaces around the outside of a five story atrium. It naturally ventilates, and every five stories is an open space in the middle of the section of the building, and it stacks and stacks and stacks to the top. And I think that to re-think the inner workings of a tower is a tremendously important thing. To think of a tower just being a candle or a tall pillar full of space the same on the bottom all the way up to the top is the past, it’s simplistic. To think of a more reinvented mixed-use tower with multi-functions and multi-spacial typeologies through the tower is more interesting and is probably the future, and that building does it in a very strong way. DnA: Can a tower ever be too tall, or is height relative to surrounding buildings? SJ: There are different ways to answer that question. Can it ever be too tall? How tall will the tallest building be? I don’t think we know. I don’t think there’s any certainty that we’re at the tallest now, as we’ll always be outstripped and see taller buildings. But I think that a building could be so out of scale with the adjacent neighborhood that it throws shadows over significant areas that don’t want to be shaded. It obstructs view corridors to majorly important areas, and throws the scale of the city and its profile out of balance, so I believe it can and sometimes it does happen. DnA: Back to LA. 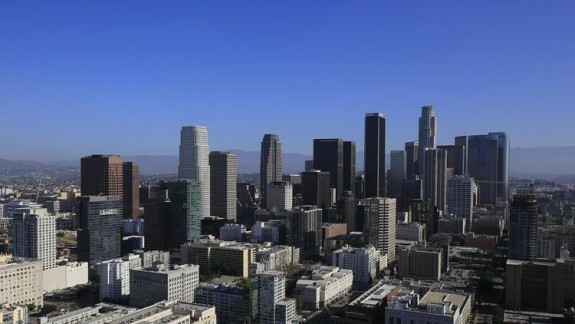 We no longer need so-called “flat-tops” on the top of skyscrapers downtown Los Angeles. What does this mean? Will we see less stumpy towers in downtown? SJ: It’s almost inevitable that we will see less flat top buildings now that these regulations have changed. A number of architects who do tall buildings-myself included-have petitioned for this for two decades or more, so this is a big deal, but Robert “Bud” Ovrom, the former head of Building and Safety, has pioneered this, and it has finally come through, and I have to believe that both clients and architects will be excited about the possibility of tops. Think of all of the things that rooftops can be now that they don’t just have to be a helipad. They can be gardens.They can be public spaces. They could be view areas that are publicly accessible. They could be public spaces to have concerts, and meeting spaces. They could be food areas. 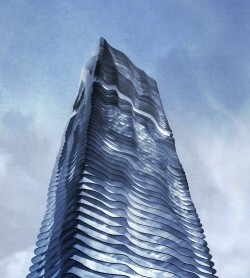 And they could be shaped of course to be more interesting visually on the skyline. DnA: What does that do for the L.A. disaster movie? SJ: Well, they’ll have to find other kinds of disaster. In Los Angeles, we’ve always been the capital of disaster, I’m sure we can find other ones. 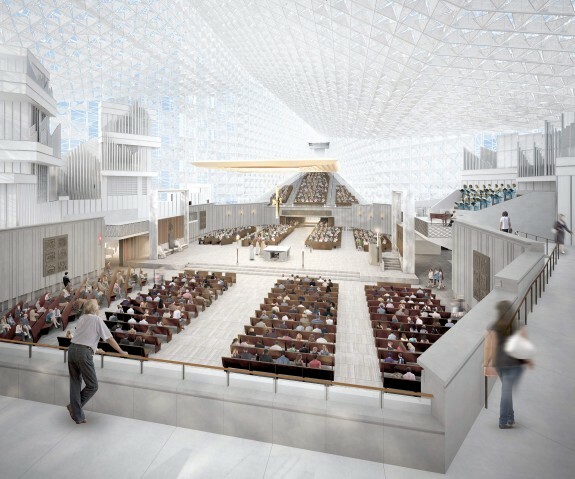 DnA: Down much closer to the ground, you are working on a remodel of the onetime Crystal Cathedral, to become the Diocese of Orange. It was designed by an architect you worked for at one point: Phillip Johnson. Can you talk about it? SJ: It’s very interesting. I was actually in Johnson’s office in the late 1970’s and early 80’s when the project was being designed and conceptualized and built, and so in my particular case I have a lot of thoughts about what can and might be done to it, but also this particular design opportunity reminds me of so many things that were going on in the office of Phillip Johnson at that time that related to why the building was made the way that it was. So, it’s exciting for me on many levels. DnA: But just tell us if you can, what are you doing? SJ: The building is revered by many in the architectural community and beyond as an important work of architecture. We’re attempting to restore and really conserve the entire shell, the exterior shell, and everything you see, the container if you will. Once you go in, there’s so many differences in the way that the building was used with Reverend Schuler, and the way that it will need to perform as a Catholic sanctuary that we’re substantially changing the interior. The challenging part and the interesting part was how to think about this building of all glass, and to use it and channel it in a way that it supports the liturgical events of the Catholic Church which in most of our minds, because of the way great cathedrals have been built over the decades and centuries Europe or South America, tend to be dark, misty spaces with channelled mystical light coming through stained glass. 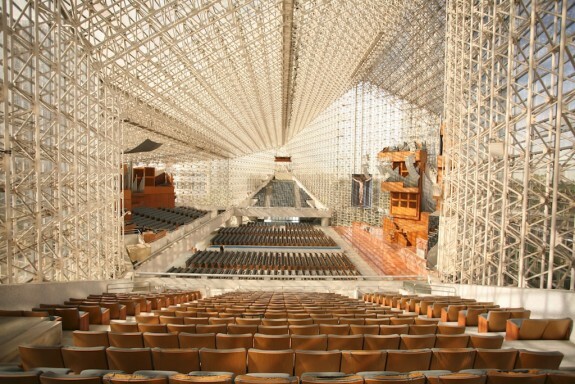 And the Crystal Cathedral is quite the opposite of that, of course. It’s all glass, from floor to ceiling. The entire daylight of the sun comes through, so it’s a challenging effort to think about how to modify and use the light, and how to rework the entire interior. So what we are doing is, we’re building a building within a building. Listen to Bill Fain, Scott Johnson’s co-principal at Johnson Fain, talk to Steve Chiotakis about the impact of getting rid of the flat top rule.